One hundred years ago utility companies used massive steam-powered engines to pump water throughout communities. These five-story behemoths were impressive for their time but had become obsolete decades before the end of the twentieth century. As infrastructure was upgraded, most were dismantled and sold for scrap; few managed to survive. One survivor is in the long-defunct New Milford plant of the former Hackensack Water Company in Oradell, New Jersey. The waterworks was established in 1882 and operated continuously for over one hundred years before closing in 1990. Over the last twenty-five years it has avoided several close calls with demolition. Today the plant’s future is not yet guaranteed, but the buildings still stand because of fortuitous circumstance, government indecision, and the hard work of a passionate few. Toward the end of the nineteenth century, the United States’ lack of a centralized water system was a significant contributor to the spread of disease. Fragmented wells and poor quality drinking water wrought havoc on the population via illnesses such as typhoid fever. Various waterworks were formed around the country to centralize and control water quality and supply. The Hackensack Water Company (HWC) filled this role for New Jersey communities in 1881, when it signed a 10-year contract with the city of Hoboken to supply its drinking water. Van Buskirk Island, which straddles the New Jersey boroughs of New Milford and Oradell, was chosen by HWC as the site for what would be called its New Milford Plant. The artificial island was formed in 1802 when dams were added to support the mills along the Hackensack River. It was attractive to industry because of its proximity to rail supply lines and a reliable water source. In 1837 John and Jacob Van Buskirk purchased the island and established J. & H. Van Buskirk Gristmill (pictured above right), which operated on the southwest corner of the island for over forty years. Things changed for Van Buskirk Island in November of 1881 when Hackensack Water Company purchased the island for $50,000. The company’s first order of business: Laying miles of pipe. The construction of the plant’s red brick Romanesque Revival buildings took place from 1882 until 1911. First to be erected were the Pumping Station and large coal shed/boiler house, the inner workings of which were designed by the company’s chief engineer and water system pioneer Charles Benjamin Brush. Brush’s system was revolutionary for the time, including a massive infrastructure complex which extended two levels below ground. The grand opening took place in 1882, however construction from expansion and updating would be an ongoing process for the next seventy years. The early crown jewel of the Hackensack Waterworks was its Worthington Duplex Pumping Engine, a steam-driven behemoth capable of delivering 3.8 million gallons of water per day to Hoboken’s 30,000 residents. As the population grew, so did the need for fresh water. In 1886 another Brush-designed building was added to house a new 10 million gallon-per-day Worthington. Another building was added in 1891, enclosing two more Worthingtons to further increase capacity. The two-story addition the pump station was built in 1898 to house two vertical triple expansion pumping engines (numbers 5 & 6). This modification, which included the chimney stacks seen today, helped increase output by 150%. In 1901 a new reservoir was created in Oradell, New Jersey just a half-mile from the New Milford plant to help the Hackensack Water Company keep up with demand. Five years later the Hackensack Water Works Filtration Plant was formally opened, in 1906. It used a rapid sand filter in a twelve million gallon coagulating basin constructed just east of the main building. The Filtration Plant housed an impressive four-story coagulant facility, which included a laboratory for analyzing and testing both the raw and filtered water supplies. From 1911 until 1912 the largest extensions to Hackensack’s New Milford Plant were completed. These additions introduced Pumps 7, 8, and 9 and increased water output by thirty-five million gallons per day. Twenty million of those gallons came from the mammoth Pump No. 7 (pictured at right), an Allis-Chalmers Vertical High Service Pump. The fifty-foot leviathan was capable of moving more than 600 gallons of water per revolution of its thirty-two ton flywheels. In 1912 the Filtration Plant was expanded to house eight new filters. This raised capacity to forty-eight million gallons per day. Improvements in technology dictated the upgrade to the No. 3 pump in 1915. The Allis-Chalmers No. 3 could pump thirty-six million gallons per day, nearly twice the capacity of the larger and older No. 7. 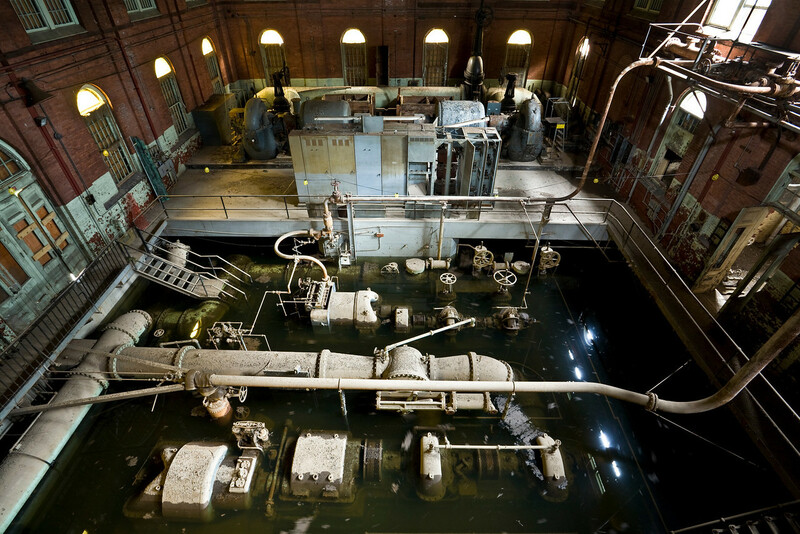 The water utility operated the steam pumps for over 70 years, keeping them polished and in immaculate working order until the plant closed in 1990. The diagram above shows the movement of water through the Hackensack Water Works facility. Water was brought from the Hackensack River via the intake canal where the first large screened filter removed leaves, branches, and other large debris. From here the water was piped through the Pumping Station by pumps that moved the raw water to the Coagulation Basin. Fine particles settled to the basin floor through sedimentation and the addition of treatment chemicals. Once finished with its slow progression through the Coagulation Basin, the water was gravity-fed to the Filtration Plant. The water then moved through beds of sand and powdered-activated charcoal. This filtration process guaranteed delivery to customers of the highest quality clean water. Pipes transported the water from the Filtration Plant to the Pumping Station. Pumps then delivered the water to customers in Bergen and Hudson County (courtesy Rutgers). In addition to the visible buildings, the site contains a vast underground network of pipes several stories below ground. Due to the plant’s location in a flood plain, the subterranean network of pipes were built to withstand regular inundation by water. The final building expansion to the Filtration Plant was completed in 1955; six filters raised the plant’s capacity to seventy million gallons per day. By the early 1960s the Hackensack Water Company had reached its zenith, pumping over 100 trillion gallons of water per year. Advances in water technology and regional population growth meant it was only a matter of time before the old steam engines and the red brick buildings they called home would be obsolete. Functionally this occurred for the New Milford plant by the middle of the twentieth century. It was a regional need for additional capacity that kept the venerable pumps online until the 1980s. In 1964 the Hackensack Water Company opened a state-of-the-art facility in Haworth, New Jersey. This treatment plant was more advanced and cleaner operating, capable of moving another 50 million gallons per day for the water company at a lower cost. The operation on Van Buskirk Island would gradually be phased out as responsibilities were transferred to the newer Haworth facility. From the early to mid-1970s the plant’s operations continued to shrink; by the end of the decade it had become a financial burden to its operators, who by this time had elevated their search for a way out. In an effort to curb rising rates, the state Board of Public Utilities mandated in 1983 that the water utility reduce its land holdings. Decommissioning was still six years away when the water company began transferring property and land rights in 1984. Former watershed land encompassing some 700 acres across 50 parcels was donated to nearly a dozen Northeast Bergen County municipalities. For the old New Milford filtration plant on Van Buskirk Island, the operational end would come in late spring of 1990. By this time an expansion of the Haworth plant had been completed, allowing for the water company’s final capacity shift to occur. When the facility was shuttered on May 31st, 1990, it had served the community for 108 years. By this time closing was more formality than theater; the jobs had been long gone, vaporized by steam engines which anchored the plant in the nineteenth century. Aerial view of Hackensack Water Company’s New Milford Plant. The New Milford water filtration plant was closed for a year before Hackensack Water Company announced action. In August of 1991 the HWC offered to give Bergen County a mile-long stretch of riverfront property in Oradell and New Milford, including the hundred year-old buildings of the plant. The gift included the old water plant buildings and 47 acres, valued between $3 and $4 million dollars. Estimates to raze the site ran between $2 and $6 million dollars. County Executive Schuber would accept the land with the stipulation that the water company pay for the $2 million to $4 million razing of the plant. Alternatively, a study showed an immediate $1 million to $2 million outlay was needed to repair and stabilize the buildings – and subsequent maintenance would cost $110,000 a year. The water company wanted the buildings off its books and was willing to accommodate the County if necessary. For example, the utility agreed to pay taxes and the maintenance costs for the site until the County could find a developer and approve a use for the property. It also reluctantly agreed to finance the demolition should no developer plans develop. With conditions met, in late September of 1992 County Executive Schuber recommended the county accept the gift – however the final stamp of approval would still have to come from Bergen County’s Board of Freeholders. Once word of potential demolition reached the public, members of the community displayed outrage. A debate ensued with potential preservation grant dollars driven by an argument whether the hundred year-old site held historical significance, or was merely an antique. County officials tempered objections by announcing a historical and archaeological survey would take place before any decision is made. Estimates to redevelop the site approached $9 million dollars; the county agreed to also seek development proposals from outside parties who could offer their own financing. Six proposals came through in June of 1993, two of which piqued the interest of county officials. One of the plans proposed converting two of the century-old buildings into fifty units of affordable housing; another converted one building into residential units and another into a small shopping mall. Meanwhile, the pace of the county’s decision making was beginning to worry the water company, who was still on the hook for the maintenance costs and taxes on the property until a decision was made. It took several studies and two years of talks, but on October 20th, 1993, Bergen County finally agreed to accept the land gift from the water company. To facilitate the deal, the water utility agreed to pay the county $1.1 million toward either demolition or re-use of the New Milford site, surveyed at 64 acres instead of the previously estimated 47. Regarding the tax revenue shortfall, the water company agreed to pay the taxes for the remainder of 1993 with the county picking up the bill for 1994, paying a total of about $100,000 to the two affected boroughs. The deal assumed that, by 1995, the property will have been demolished or redeveloped. In the interim, the old New Milford plant on Van Buskirk Island was added to the county park system. In December of 1994 a high school teacher and his students spent several days inside the plant salvaging steam-engine parts and tools, hauling them back to their school for refurbishment. The equipment became part of a collection of 30 operable antique steam-driven turbines restored by students. February of 1995 witnessed a small push for converting the New Milford plant into affordable senior housing and an engineering museum, but as before the problem was a lack of money. The following year non-profit PENWAL Corporation envisioned building 35 affordable senior housing units and 35 market-rate units, a 5,000-square-foot senior citizens center, a 55,000-square-foot retail building including 8,500 square feet of smaller shops, and close to 400 parking spaces. Residents feared this would disturb the solitude offered by the wooded Van Buskirk Island. The developer claimed the supermarket and shops were necessary to subsidize the building restoration and housing costs. With the two sides unable to reach an accord, the plan stalled. By June of 1996 Bergen County had enough; officials gave Oradell until the end of August to decide what to do with the land. If the borough could not find a suitor to redevelop, the property would be razed. The city pleaded for more time to give developers time to put together proposals. Schuber extended the deadline to November 1st, 1996. This allowed several proposals to roll in. First was PENWAL, with its second attempt, submitted in August of 1996. Their new proposal was for a retirement home community, including a nursing home, senior care, and other housing for the elderly. Other proposals included a Korean Catholic Church and headquarters for a non-profit preservation group. By October of 1996 city officials had five more proposals to evaluate, including a valve assembly plant, multifamily housing, and a museum featuring an art gallery and bookstore. None would ultimately pass muster, which forced Oradell Mayor James Snedeker to ask for more time. Schuber complied, extending the deadline until December 1st, 1996. The disconnect stemmed from what initially seemed to be contradicting goals. Local preservationists desired a solution that didn’t include razing the buildings or adding retail businesses, fearing an increase in noise and traffic. Bergen County officials simply didn’t want to be on the hook for administrative and maintenance costs, preferring the safe route of razing the buildings and transforming the space into a passive park. Oradell was not enthusiastic about losing the taxable revenue as a result of converting the site into a park; rather, they were interested in redevelopment – possibly preserving the buildings if it could be subsidized by the other businesses operating out of the old plant. Time was running out; none of the proposals ticked all the boxes. Unfortunately for the preservationists, the fallback was the county’s preferred solution of razing the buildings and converting the site to a passive park. Oradell officials felt that financially, their hands were tied. In November of 1996 the city decided the passive park concept was the most feasible course of action. In December an eight-member task force was assembled to consider the logistics of such a move. The task force, appointed by Schuber, consisted of four county officials and four city residents. Their mission was to draw up a plan and secure funding for the site in the next 18 months. By the spring of 1997, not much had changed. As had been the problem for the last seven years, the task force was having a difficult time sourcing funding for site preservation. Specifically, the group hoped to preserve the pump house building, which contained the “Old Number Seven” steam engine. The task force was split on whether to raze the entire site or preserve a part of the former water plant. An eventual rift formed within the group, which began to exhibit more secrecy. In August of 1997 the group’s cards were so close to their vest, the public complained about the task force’s lack of transparency. A volunteer group applied for a $1.2 million state historic preservation grant and citizens in favor of preservation applied for recommendation to listing the former water plant on the Register of Historic Places. Schuber, knowing that being added to the register would slow the metamorphosis into a passive park, asked the state historic preservation office to delay placing the site on the register until the task force had developed its plan. Meanwhile, the rift in the task force grew. In October one task force member claimed she was not told that a consultant had been hired to help them until she read about it in The Record last month. The study found complete demolition would cost approximately $1.8 million. Costs to preserve the pump house and part of the adjacent water filtration building were estimated to be $14.6 million. Finances were looking dire; the group had just $800,000 remaining from the $1.1 million donation by the former Hackensack Water Company (now United Water). At the time the only outside funding secured was a $575,000 grant through the state’s Historic Trust – but this money was contingent on the preservation of the entire pump house and the oldest sections of the water filtration plant. The aforementioned study estimated this cost at nearly $15 million, meaning the $575,000 grant was not significant. By October of 1998, the task force’s best suggestion was turning over the preservation to a non-profit corporation. In January of the following year, the group released their report to the public. The report offered six options, all but one of which preserved at least a portion of the pump house. The time to implement the options ranged from 7 to 18 months. Hackensack Water Works’ greatest benefactors would be those behind the Water Works Conservancy (WWC), a non-profit founded in 1994 as part of a grassroots effort to preserve the historic buildings. Front and center was Maggie Herrer, a vocal advocate for the preservation side and coincidentally also a member of Schuber’s task force. In February of 1999 the WWC offered to take over the former industrial site, restore the buildings, and turn the remainder into a nature preserve at no cost to taxpayers. Under the proposal, the county would lease the non-profit the site for $1 per year for 25 years. The WWC would finance the project through a combination of environmental and historic preservation grants from state, federal, and private funds. By May of 1999 Bergen County officials agreed to the proposal, but were unconvinced the conservancy would be able to raise the required funds. They reluctantly agreed – on the condition that the city of Oradell be on the hook for the site if the conservancy’s fundraising efforts failed. New Milford residents were not as enthusiastic, the borough’s environmental commission being particularly vocal of its unconditional opposition to preserving the buildings on the site. “I BELIEVE THE WATER WORKS CONSERVANCY IS LOOKING TO SPEND DOLLARS TO THE MEMORY OF A GIANT BRITA WATER FILTER AND A BIG SUMP PUMP — SOMETHING THAT HAS LITTLE PUBLIC INTEREST AND MINIMAL HISTORIC SIGNIFICANCE. Yet despite the opposition, the dominoes appeared to start falling in the right direction for preservation. If the WWC’s ownership bid was approved, it could potentially unlock millions of dollars in grant money. Everything seemed to come unraveled when the preservationists lost a key ally in Oradell Mayor James Snedeker. The mayor had been a key supporter of preserving the buildings, the lone voice in government with such a position. This would ultimately prove to be far from the truth, as in April of 2001, the Oradell city council reversed course and passed a resolution stating it would not take ownership of the site if the WWC failed to secure financing. In what would prove disastrous, the non-profit had lost its co-signer. The other shoe would drop when preservationists lost their final ally in Bergen County Executive Pat Schuber. Previously amenable to a conditional partial preservation, Schuber announced in May of 2001 he now intended to recommend the demolition of the buildings, primarily because the group could not guarantee it would have the funds to develop the proposal. Schuber admitted his change of opinion was directly influenced by Oradell’s new refusal to assume financial responsibility. Detractors were also pointing to the liability created by the site’s location in a flood plain, citing the five feet of water which had flooded the island after Tropical Storm Floyd in 1999. A lifeline came in June of 2001 when the state of New Jersey named the former Hackensack Water Company plant as a historic landmark. Three months later the Federal government got involved when the National Park Service added the water works to its National Register of Historic Places. A spokesperson from Schuber’s office said the designation would have little impact; however preservationists acknowledged that at a minimum, the move erected another hurdle toward demolition. What does inclusion on the National Register offer? Little in the way of practical protection, although it does require agencies overseeing a project to take any given site’s historical significance into consideration. This appears to be a gray area and largely subjective, but for the drowning water works buildings – which were steeped in historic milestones – it was a life-preserver. In December of 2001 all parties involved debated a new $9.1 million plan, one which would see the water works turned into a Rome-style ruin. This compromise would demolish the majority of the plant, but it preserved several buildings. The 1911 pump house with its smoke stacks and steam engine would be preserved as a partially enclosed garden, while the shell of the filtration plant would serve as a backdrop for an amphitheater. Before the year ended, New Jersey’s Historic Sites Council threw cold water on the plan to demolish the old Hackensack Water Company. Bergen County freeholders rebutted in March via an urging of the New Jersey environmental protection chief to allow them to demolish the buildings, so they can turn the site into a passive park. However Bradley Campbell, the state’s environmental protection commissioner, had only been on the job less than two months. Wanting time to familiarize himself with the entire case, Campbell extended the deadline for any ruling until June. By late June of 2002, the issue had reached New Jersey state legislature. In Assembly Resolution No. 141, the Commissioner of Environmental Protection was urged to preserve the New Milford plant. Commissioner Campbell was still collecting information, so the environmental protection commissioner again postponed his decision, this time until 2003. Voices of the naysayers seemed to grow louder. Immediately after Schuber departed office, the demolition debate seemed to cool. This was partially attributed to Schuber’s successor Dennis McNerney, who upon taking office in January of 2003 declared he preferred to preserve the structures – albeit with limited access to the public. As the political winds changed tack, so did those who were involved with developing plans for the waterworks. But it wasn’t until April of 2004 a new concept was presented to the freeholders: A part-time museum and scaled-down passive park. Meanwhile Bergen County Administrator Timothy J. Dacey shared news that work to stabilize the buildings could begin as soon as the summer of 2004. Estimates for the stabilization approached $1 million. The county had $785,000 remaining of the $1.1 million subsidy from the water company; the remainder of the funds would reportedly come from a $500,000 state historic preservation grant. In March of 2005 the Oradell City Council voiced their approval for a plan submitted by Hackensack Riverkeeper Bill Sheehan that would permanently prevent development and reuse of the century-old waterworks. The conservation easement proposal was meant to prevent developers from transforming any of the buildings into retail, residential, or commercial buildings. At first blush this appeared a blessing, however most development proposals involved residential or retail business to subsidize the preservation of the old structures. Without such economic support, developers would walk. This would have been a disaster for the boroughs, pushing full financial responsibility onto the municipal budget sheets. It was also the reason Sheehan’s plan was ultimately not selected. In April of 2006 work began to replace deteriorating walls and roofs to prevent additional water damage to the building interiors. The one month long project was estimated to cost $436,000. Meanwhile Bergen County Administrator Tim Dacey said he was getting 10 calls a week from developers about the property. Unfortunately, none of the calls involved a proposal which ticked all the necessary boxes. When the banks stopped lending in 2007, developers stopped calling. For the next two years the ripples from the financial crisis proved to be additional hurdles. Relief came in September of 2009 when Bergen County announced it had secured a $750,000 state grant to fund stabilization work – and that it had applied for an additional $1 million. Meanwhile city officials expressed frustration that the immense cost spent three years earlier on roof repairs had been undone by vandals who broke the windows. The padlocked doors had been defeated, and despite security patrols the site was penetrated often. Other issues persisted, such as groundwater seeping through the building’s foundation and into the grand pump room. The stabilization grant began to accelerate discussion on the waterworks, and in November of 2009 more than two dozen Oradell and New Milford residents met with experts and officials to receive updates and share ideas. By April of 2010 professors from Rutgers University got involved, and co-hosted a public meeting with officials from Bergen County to discuss the future of the plant. Their first proposal envisioned a nature refuge coexisting with preserved waterworks buildings which showcase the history of the Hackensack River and the regional water supply. In September of 2010 officials hung banners and posted signs on the property to encourage residents’ input on redevelopment. Banners read “Work In Progress: Your Thoughts?” and directed residents to a Rutgers University webpage that proposed ideas. The $2 million project to repair the roof and stabilize the chimneys began in June of 2011, shortly after the New Jersey Historic Board of Trustees recommended a $704,384 Historic Preservation Grant.. In January of 2012 residents caught wind of the Historic Preservation Trust’s plan to shift $500,000 in funds from the waterworks toward an open space project in nearby Saddle Brook. This was in addition to the $103,303 of Hackensack River Pathway Funds already under review for re-allocation. The site’s grant, previously approved in August of 2011, had been overridden by the Freeholders. The decision was met with outrage in the community, sparking protests rallied by cries of “demolition through neglect.” Lobbying by preservation and activist groups was ultimately able to sway Felice, who surprised many when he announced a reversal of opinion in March of 2012. The Freeholder board voted unanimously to approve the $500k grant, and later in July of 2012 approved a chimney stabilization proposal allowing up to $785,713 to be spent on the old Hackensack waterworks plant in Oradell. This would escalate to $1.2 million by December. Since 2012, Bergen County, along with the boroughs of Oradell and New Milford, have continued to offer a meager maintenance program for the buildings; however due to financial limitations, it has been more of an arrested decay program rather than one of restoration. It seems any hope for a proper restoration would require a significant financial benefactor – one willing to sustain a large unrecoverable loss. The halls of the former Hackensack Waterworks pumping station no longer hum with the syncopated rhythm of its steam engines. Architecturally the buildings remain handsome, if not imposing relics, but their classic dark-red brick Romanesque Revival style is one not often seen in newer construction. Why is the Oradell water plant worth saving? The development of the Hackensack Water Works buildings and the innovations in water delivery and filtration systems are nationally significant as a model of water works engineering from 1882-1931. Preservationists tell us the method of carbon filtration, which later became an international standard, was developed at the site in the 1920s. There is also the fact the facility is the only remaining intact Rapid Sand Filtration Plant and Pumping Station in the nation, and the plant’s enormous pumps are among the few remaining complete examples in existence. There is no debate that being the first in anything has a historic significance, but so too can being the last of its kind. Water was not invented in Bergen County, but the remains of the Hackensack Water Company’s New Milford plant can show future generations how steam-powered nineteenth-century water improvements enabled cities and towns of yesteryear to deliver purified water on a large-scale to Americans for the first time. We can always look at pictures of animals in a book, but there is something to be said for visiting a zoo. Seeing vintage machinery like Old Number Seven in person would probably leave a greater impression too. A beautiful, well thought out post as always! I’m just wondering if you’ve ever considered writing about some of the abandoned hydroelectric power plants around Niagara Falls. Many of them still exist and have a long, interesting history behind them that speaks of the great men behind them. These old buildings are so beautiful. I just don’t understand how governments get so locked up that no creative solutions can flow out. Had they invested at the time of closure this would’ve been a perfect property. To have been turned into cool flats or an open market, like Quincy Market in Boston and so forth. That’s exactly what I was thinking when I was reading this great article. What could you possibly re-use these buildings for, if your goal was to preserve the machinery inside as well? It could only be a museum because no business today can realistically use those steam engines. Even if you could get them working again they would be massively inefficient, no? I wish it could be saved, I’m just being practical. I can see Schuber’s position. Great point Michael, I was thinking the same thing. The condition of the infrastructure is probably not up to standard for re-use. Short of making it a museum, you’d have to rip out all the piping for any redevelopment or razing. It’s a tough predicament to break down the details, I don’t envy the decision makers. The coagulation basin can probably go though, right? this was a great read! definitely beautiful buildings hope they can be saved. Thanks Dan, I appreciate the comment. And Agreed! I have been to New Jersey but not Oradell or New Milford. Fantastic article, I will share with my friends thank you! Thank you for another interesting post, my friend! Cheers Truels. Thanks for stopping by and reading, my friend! Great article. A portion of the land was sold to Hekemian development in New Milford who attempted to build a Shop Rite but it was shot down. Was this part of the sale back in the 90’s? Thanks Donald. It could have been, I came across at least three instances where a proposed redevelopment plan was shot down due to the presence of commercial or other retail operations, especially ones that increased traffic to the area. I would imagine a Shop Rite would have triggered both of those concerns. I wonder if the failure of that development plan did anything to collapse the transaction of that sale? This property **can** be de-listed from misguided Historic Preservation. A money pit with NO results, it’s long overdue. Passive Park with sculpture and museum could have worked. It’s sad to see what a waste of money this has been. It’s only yielded legal fees for various administrations and the rest wasted on repairs. People would enjoy a park and a museum. Nobody benefits having these buildings decay. Great article! I happen to be one of the students from Bergen Tech removing equipment from the pump station. It was an amazing experience working in the old plant. I grew up in Dumont and passed the pump station quite often , admiring the buildings and what was inside. It is nice to see that everything is still standing, but sad to see vandals breaking in, and nothing open to the public. Thanks Erich, appreciate you stopping by. That’s pretty neat, I bet that was a great experience indeed. Color me jealous! Sounds like it gave you an appreciation for the place and its history. Hopefully something is done soon before the buildings are lost forever. Thanks for leaving a comment! Keep the buildings and the more impressive, beautiful machinery, plaque the history, gut the place and build park, restaurants, performance and store spaces around and within. Eazy peezy.